The sun shines over Seattle and its suburbia, birds sing on trees, and I’m pleased to start the week by interviewing Elisa Nuckle, the author of Dominant Race. For a chance to win her scifi novella about genetically altered humans, enter the Indie Giveaway. A musician or a pro volleyball player. Then I started reading like crazy and started writing at around 11 and knew I didn’t want anything but that. Been actively pursuing a career as a fiction writer ever since. Oh gosh, that’s a tough one. The one I remember that had the most impact was Julie’s Wolf Pack by Jean Craighead-George. From there I started gobbling up chapter books really quickly. I liked writing journal entries. When I was 11 I figured, hey, why not make a fanfic of this one anime I like? A year later I hand wrote, in bright pink gel-pen, 50 pages of a fantasy story involving shapeshifting lion-wolf-ish creatures from another world. Haha. Fantasy. As a writer, I’ve found myself leaning more towards science fiction, which surprised me at first. I still do both, but right now more scifi than fantasy. I admit I read some romance books I wouldn’t want to name because, well, the people I know would embarrass me about it to no end. Haha. Science fiction and fantasy. Sometimes they have heavy romance subplots, other times it’s pretty bleak. I think the fact that a reader once told me I could make them care while still making it an easy read was a good compliment. 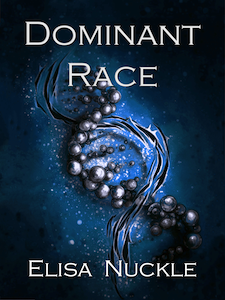 Dominant Race is the book available in this giveaway. Its sequel, New Fate, is almost finished. Then I plan on tacking the third and final book in the Modified Trilogy. Afterward, on to my fantasy series! 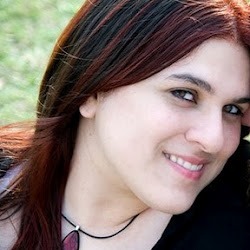 Elisa Nuckle is a twenty-something aspiring fantasy and science fiction novelist. It’s always been her dream to chase ideas down and put them into concrete words. Currently, she’s undergoing enlightenment at a community college in Houston, Texas, and plans on getting an English major in the hopefully-not-too-distant future.